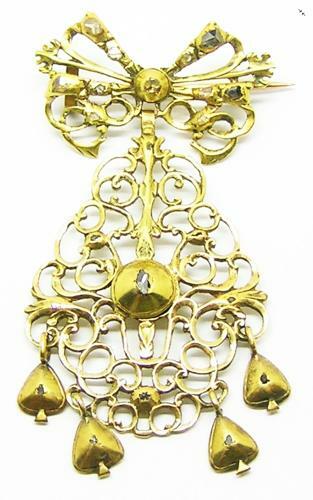 This is a nice 18k gold and diamond sequile pendant, dating to the 18th century. It is set with the original 22 rose-cut and senaille diamonds. The back of the bow retains a pin housing, being converted from a ribbon clasp to a brooch fitting. Originally this type of jewel would have been fashionably worn on a chocker, but later as a brooch pinned to the bodice. The intricate openwork surround is designed as a scrolling lozenge (sequille) shape. It retains the original four teardrop pendants, each set with a senaille diamond. These drops are designed to move or to dance in the candlelight, as an evening jewel this is when the real 'fire' comes to life! This type of jewel would have been worn as a symbol of wealth and social status, jewellery was coveted and popularised by the European nobility of the 17th and 18th centuries and can often be seen featuring prominently in contemporary portraits of the Portuguese Royal family and noble houses. Similar shaped Iberian pendants can be found in "A Sparkling Age: 17th Century Diamond Jewellery” p 215 - by the Diamond Museum in Antwerp - published 1993 and in "Five Centuries of Jewellery" p 45 - by The National Museum of Ancient Art, Lisbon - published 1995. PROVENANCE: Ex. European Private Collection, Portugal.